That doesn’t mean I don’t care or I’m not doing anything, for me reducing plastic is an everyday work in progress kinda thing. Every day I do what I can, nothing that overwhelms me, I don’t need more stress in my life, but I know that every bit counts. 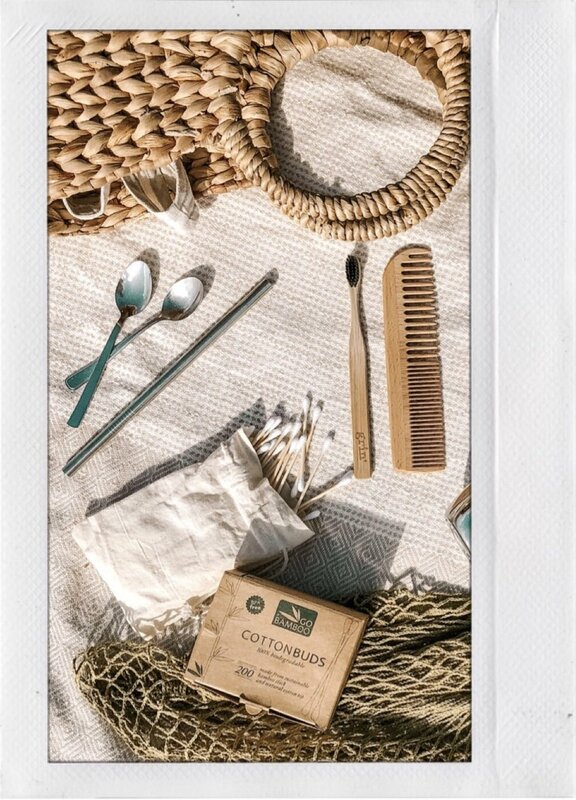 Here’s just a few things I use day-to-day, they’re simple and have been easy for me to transition to like switching out plastic cotton buds for ones that are made of bamboo. I carry all the reusable things in my bag/car—spoons and straws, reusable coffee cup, drink bottle, bags and baskets. I love bubbly water so I invested in a sodastream machine, I also check the labels of clothing and like to choose natural fibres like linen/cotton/wool over plastic fibres like polyester and nylon. When people ask me what they can do I always encourage them to choose two things they’re passionate about, my first two were not using plastic bags and swapping my plastic toothbrush for a bamboo alternative, and once your first two things fit seamlessly into your life then you add in another and then another. Take it slow and let them become your normal, this isn’t a quick fix kinda thing, we’ve gotta be in it for the long haul and changing habits takes time and practice. I also think it’s important to inspire and encourage rather than shaming or putting down others, you never know what others have going on in their lives and I like to believe we'll all there there some day. It’s been a few years in the making but the things I’ve adopted to reduce my plastic consumption come naturally to me now and if one day I forget I don’t beat myself up or give in, I let it slide and keep doing my best, whatever that means on that day. Be aware, be kind and start where you can.